Notes: I’m having some quirky problems with my website so I am using bullets to separate the paragraphs in this post. 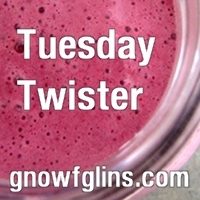 I am also submitting this post as part of the Tuesday Twister Carnival at GNOWFGLINS. Please visit Wardeh’s site to see all the other wonderful weekly posts. 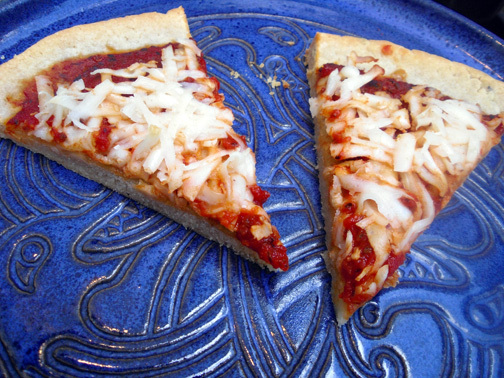 As promised, I am posting a recipe for gluten-free pizza crust. However, this is a different recipe than the one that I mentioned in my review of premade pizza crusts. The following recipe is for a tarte style gluten-free pizza crust that I adapted from a recipe in Nourishing Traditions, by Sally Fallon. I have been slowly transitioning to more traditional methods of preparing and making baked goods, as suggested in her book. The main step that is added in traditional methods of preparing baked goods is to soak the flour for 12-24 hours in yogurt, buttermilk, or water with lemon juice or apple cider vinegar if you can’t eat dairy products. This extra step (though it takes planning and time) makes baked goods much more digestible than if they are baked without soaking. Through soaking flours, the process of lacto-fermentation begins, which is a natural process that creates healthy bacteria like the ones in yogurt and traditional sauerkraut. I have to say I’ve been somewhat resistant to transitioning to this new “lifestyle” of soaking flours ahead of time. I usually end up wanting to make something right before I’d like to eat it, which doesn’t work so well for this process. But after making my muffins, and then this pizza dough, I am becoming sold on this way of preparing baked goods. And it is mostly due to the way these baked goods make me feel verses ones that aren’t soaked first. When I ate this pizza crust, I didn’t get that “carbohydrate rush” that comes with most baked goods. Instead, I felt nourished and fulfilled. My blood sugar remained “stable” and it also felt more like a meal than regular pizza makes me feel. I didn’t have any digestive upsets from it at all, which I normally have even a little bit of after I eat non-soaked flours, even if they are gluten-free. On the contrary, I felt like it was nourishing food for my body.